Kong is a new slot game based on the famous epic tale of King Kong. Following the theme of the recent Hollywood Blockbuster movie. Kong "The 8th Wonder of the World" online slot machine has wilds, scatters and bonus symbols that are used to help complete a paying combo, and a scatter card. You get a bonus when you land 2 scatter symbols on the screen. Land 3 and you are into the Kong Bonus game. 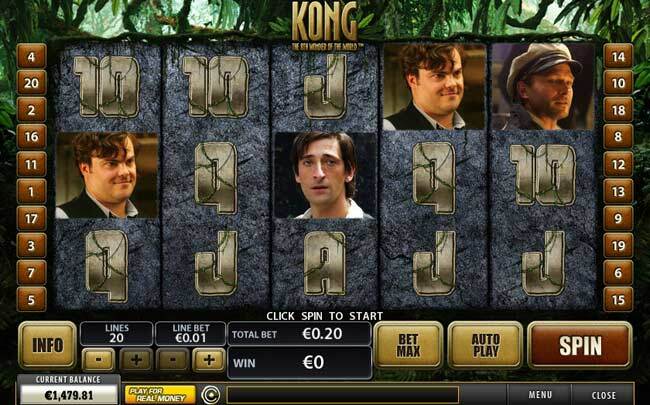 Kong uses stills and movie clips from the motion picture and also has dramatic original score music to make this a truly dynamic online video slot game.